Scientists at the Massachusetts Institute of Technology, taking advantage of multiple unique views of black hole particle jet over the course of a year with NASA's Chandra X-ray Observatory, have assembled a "picture" of the region that has revealed several key discoveries. They have found that the jets may be originating five times closer to the black hole than previously thought; they see in better detail how these jets change with time and distance from the black hole; and they could use this information as a new technique to measure black hole mass. Presented in a press conference at the meeting of the American Astronomical Society in Atlanta, the observation will ultimately help solve the mystery of the great cosmic contradiction, in which black holes, notorious for pulling matter in, somehow manage to also shoot matter away in particle jets moving close to the speed of light. The observation is of a familiar source named SS 433 -- a binary star system within our Galaxy in the constellation Aquila, the Eagle, about 16,000 light years away. The black hole and its companion are about two-thirds closer to each other than the planet Mercury is to the Sun. The jets shoot off at 175 million miles per hour, 26 percent of light speed. 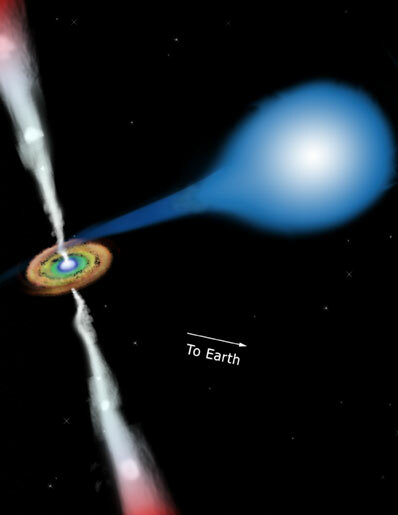 "The high-speed jets in nearby SS 433 may be caused by the same mechanisms as the powerful outflows in the most distant and much more massive black holes, such as quasars," said Laura Lopez, an undergraduate student at MIT and lead author on a paper about the result. "SS 433 provides a nice local laboratory to study the formation of and conditions in relativistic jets." Dr. Herman Marshall, Ms. Lopez's research supervisor, led the investigation. Matter from the companion star pours into the black hole via a swirling accretion disk, much like water down a drain. Black hole particles jets are thought to be produced as some of the matter encounters strong magnetic fields close to the black hole. SS 433 is angled in such a way that one jet is shooting away from us while the other is aimed slightly towards us. The black hole's companion star enters the picture here as it periodically eclipses parts of the jets. Scientists use the eclipse, called an occultation, as a tool to block one part of the jet so that they can study other parts more easily. Using the Chandra High Energy Transmission Grating Spectrometer, the MIT group measured many characteristics of the jets, forming the best view of a jet's structure ever obtained. No image was created, as in other Chandra observations. Rather, the scientists pieced together the scene through spectroscopy, the fingerprint of chemical elements that reveals temperature and velocity of matter in the jets. They determined the length of the X-ray-emitting portion of the jet (over one million miles, about five times the distance from the Earth to the Moon); the temperature range (dropping from about 100 million degrees Celsius to 10 million degrees farther out); the chemical abundances (iron, silicon, and more); and the jet opening angle. In a previous observation they measured the jet's density. With this information, the team could determine that the jet base was five times closer to the black hole than previously observed, with a base diameter of about 1,280 miles. Also, from a bit of geometry along with information on the size of the binary system from optical observations by a team led by Douglas Gies of Georgia State University, the MIT group determined that the size of the companion star that blocked the view of the receding jet is about nine times the size of the Sun. From that, they estimated that the black hole is 16 solar masses. "The uniqueness of SS 433 cannot be overstated," said Marshall. "SS 433 provides an excellent opportunity to study the origin, evolution, and long-term behavior of jets because the X rays come from a region very close to the black hole. Of the hundreds of jets observed in the radio and X-ray bands, this is the only one for which we have a solid statement that it contains atomic nuclei and for which we are sure of the internal temperature and density." Supermassive black holes with jets, such as quasars, might display similar behavior, but they are so massive and so distant that changes cannot be observed because time scales are too long. Thus SS 433 serves as a laboratory to study the jet phenomenon "close to home," Marshall said. As such, further Chandra observations are planned. Chandra data were taken with the HETGS in conjunction with Chandra's Advanced CCD Imaging Spectrometer. The HETGS was built at MIT with Prof. Claude Canizares as principal investigator. ACIS was built by Pennsylvania State University, University Park, and MIT. Collaborators on the investigation were Claude Canizares, Julie Kane, and Norbert Schulz, all of MIT.